City staff will provide an overview the general organization of the new Zoning Ordinance and provide guidance on how to use the Use Matrix, Use Standards, and Use Definitions. Changes to the City’s zoning districts, and other hot topic items including parking, trees and landscaping, signs, and site development standards relating to lighting, accessory structures, accessory uses, and encroachments will also be discussed. Please call 401-680-8400 for more information. No RSVP is required. This event is open to all members of the public. A new Providence Zoning Ordinance and Zoning Map were officially adopted on November 24, 2014 and became effective on December 24, 2014. The new Zoning Ordinance and Zoning Map are the product of a multi-year collaborative effort between residents, business owners, developers, institutions, numerous City departments, and other stakeholders. A User’s Manual is also available and provides a brief overview of the organization of the new Zoning Ordinance and general purpose of the various articles of the ordinance, and summarizes of some of the key ordinance sections– including zoning districts, uses, parking standards, site development standards, and administration. This manual is for informational purposes only. 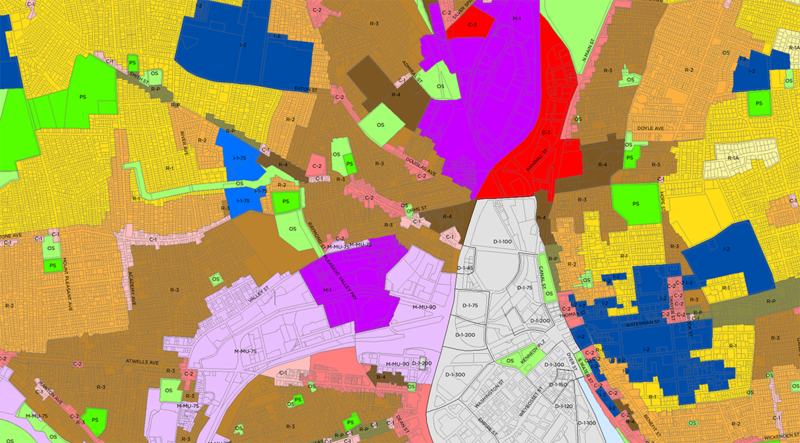 The official zoning ordinance, zoning map, and User’s Manual can be found on the City’s website at ProvidenceRI.com/Planning/Zoning.